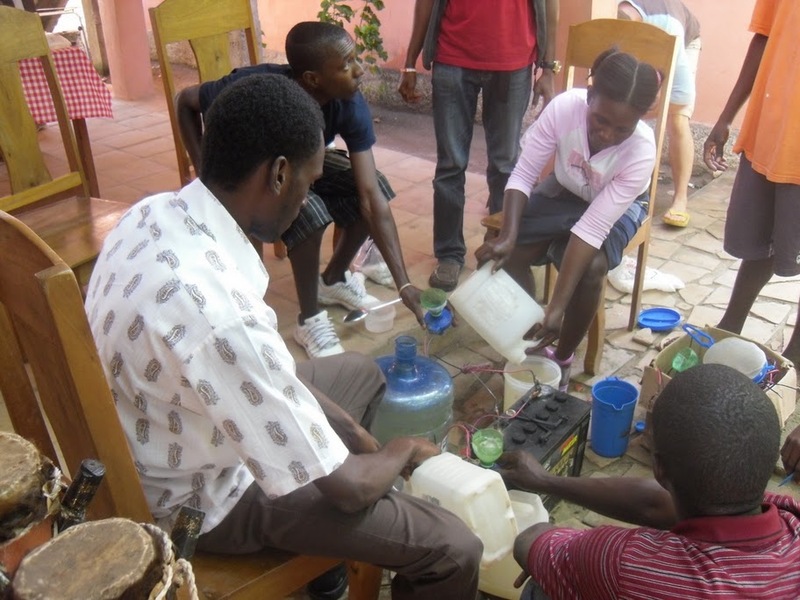 Fabricating chlorine in order to purify water to prevent further spreading of Cholera, with help from Haiti Village Health organization in Bas Limbé. The following post is a detailed summary just received from Rosedanie regarding her activities since arriving in Limbé on November 2nd, focused on Cholera-prevention, including outreach, education and other related topics. PLEASE DONATE IN SUPPORT OF THESE ACTIVITIES AND BE PART OF THIS SUCCESSFUL EFFORT TO STEM THE TIDE OF CHOLERA IN THE LIMBE’ AREA OF HAITI. THANK YOU! Arrived here on the evening of November 2nd, following a day in Santo Domingo, at Sister Island’s representative Nina Hernandez’ home. Had hoped to spend a week or so getting reacquainted with the committee and family members in Limbe’. Unfortunately, the cholera epidemic made it necessary to put those plans aside. With the help of several Tambour Creole members, I scheduled our first cholera prevention education outreach for the Camp Coq area, not far from where the Masabiel farmers cooperative wants to build its Tilapia ponds. We were able to mobilize some 60 residents, Inform them on the cause and main transmission source of cholera, methods of proper hygiene practices, water purification and food preparation to help with prevention. Gave out fliers which included the formula for the vital re hydration fluid needed to keep one with cholera alive on the long journey to the nearest medical center. Distributed soap, bleach and some re hydration packets provided by Danise Abel, president of the HHN Haiti committee. Since then we have given 15 such presentations in at least 10 areas in and outside of Limbé proper. Visited a hundred homes or so, 5 schools, distributing the same fliers and were invited to speak on 2 radio stations to give out the information. 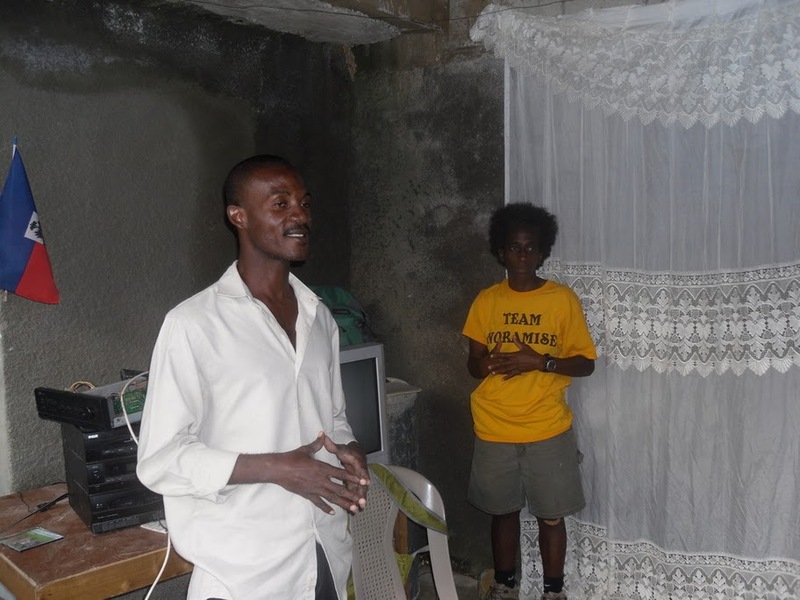 I have connected with another organization, Haiti Village Health, which has a small clinic in Bas Limbé. Dr Tiffany Keenan, its founder and director invited us to the clinic three weeks ago and had her volunteers teach ours to make a low grade chlorine using salt, water and a very simple device. Robin has all the specs on this machine for those who want to know more. She then donated 3 of them to us as well as $500 with which to pay our volunteers who are now distributing this chlorine door to door throughout Limbé.. A cap full of this chlorine can be used to treat a five gallon bucket of water. Met another volunteer from England through the same organization, who came to Haiti with a water purification system(www.cleanwaterkits.com) using a ceramic filter and 2- 5 gallon buckets. This means of water purification is the easiest and safest to use we’ve seen to date. It requires no power source, delivers treated water at a rate of 5 liters per hour and removes 99.99% of bacteria and cysts. 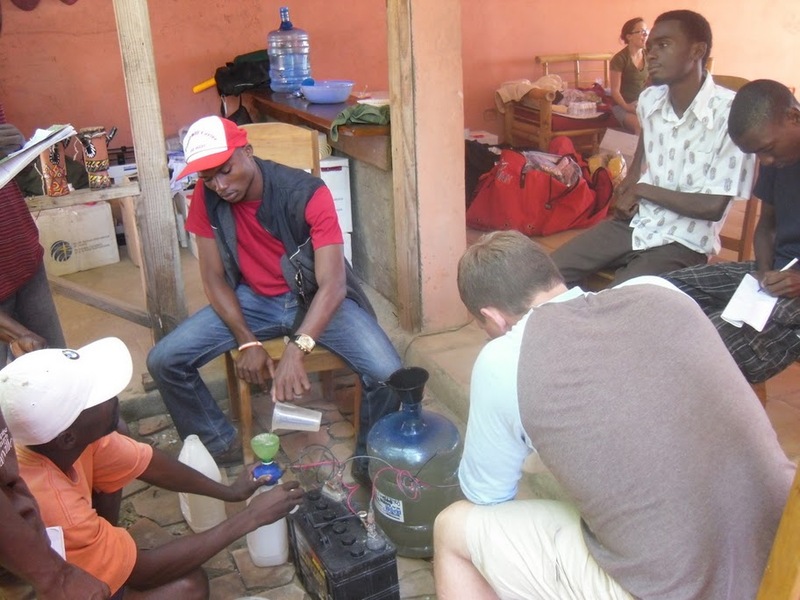 I traveled to St. Michel village with some Haiti Village volunteers and set up four purification centers there. This is an area where cholera victims were being transported via rowboat to Bas Limbé for medical care. Several of them never made it to the clinic alive. We hope to obtain more of these filters for distribution. 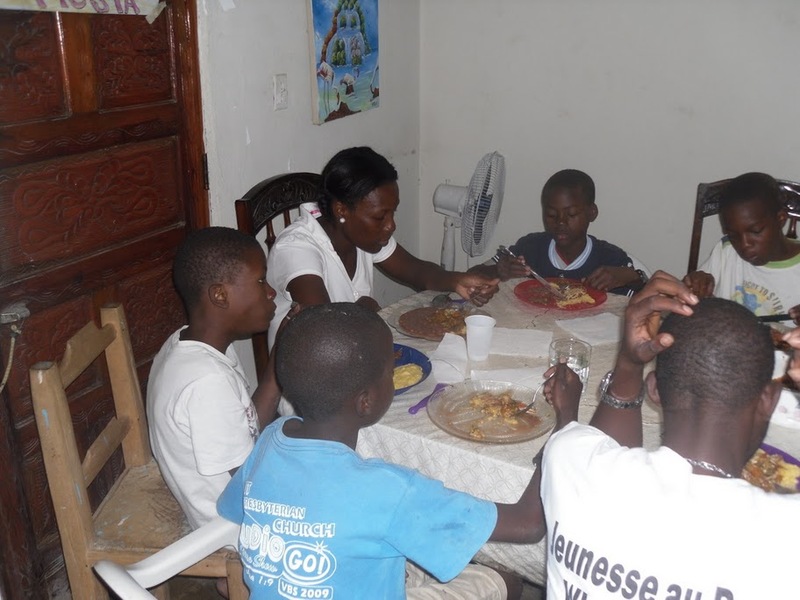 Our volunteer base is all Haitian, and as each member learns a new technique, they then have to teach it to the next person, ensuring that each member of the team really understands the new process and empowering them. This approach has been working very well and frees me to focus on other aspects of my time here. The other item that has been taking up a good chunk of time is trying to get our committee moving forward with the charter so we can be recognized as a legal NGO in Haiti. We have had several meetings to review the charter and hope to have the final version completed at out next meeting on the 28th. In the interest of building better relation between the committee members and Tambour Creole, I hosted our first potluck last night, which was a huge success. At the end of the evening Daniel Desronvil our secretary, suggested we make this a regular practice and we will have another potluck next week, which will also have a secret santa component. Charlot Kily the coordinator of Tambour Creole and I had discussed holding an all day celebration event for Independence day on January 1st. This idea was also well received by both committee members. 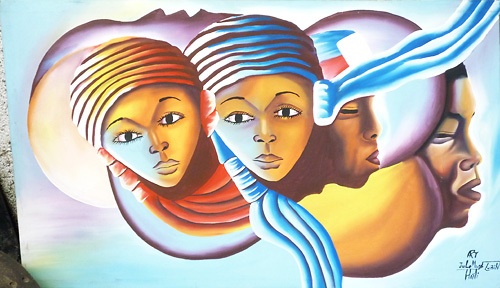 The young artists and writers that Tambour Creole have been working with, will be asked to create some works to commemorate our independence, and I’m hoping HHN will be able to finance the purchase of some small prizes for the participants. I have started a pilot ESL program at the Bethesda school, which will provide employment for a local man living across from the HHN center. Have also been teaching nutrition education to Lunise our cook/housekeeper and invite several local children here for an after school meal daily. On a personal note, I have started coaching rugby to some of the kids on Saturday afternoons. Look out All Blacks, here comes the Haitian national rugby team. Haven’t been able to get any female players yet. Well, I must get to bed now. Will send a more detailed year end report next week.